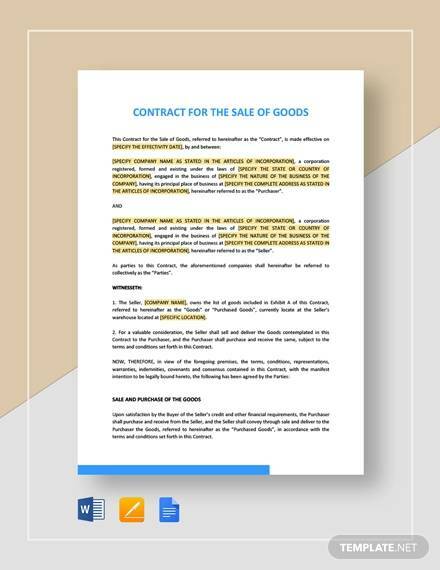 A contract for the sale of goods is an essential document used by many businesses that manufacture and sell various commodities to customers and consumers. This type of contract is most commonly used for a business-to-business transaction or any commercial transactions that a business or company may have. 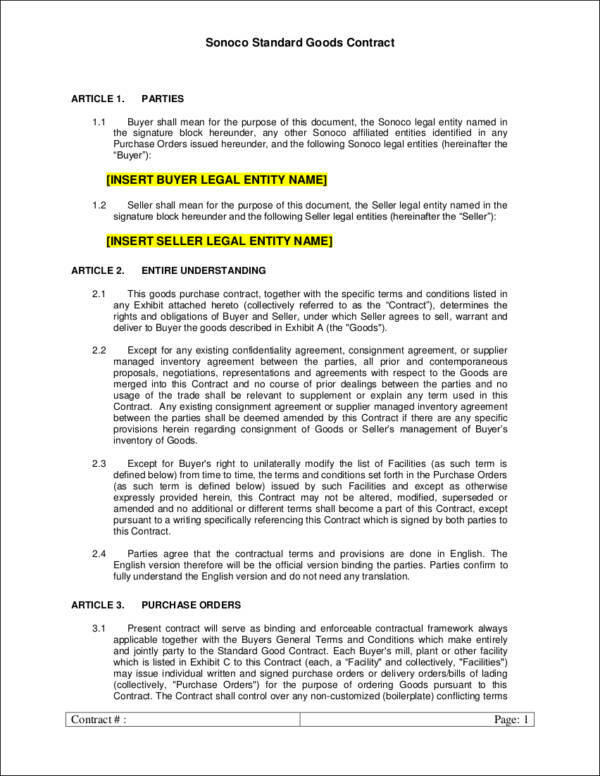 When a buyer purchases goods from a seller, a contract is made in order to have a written document that contains all the details of the transaction. This will protect both parties and prevent any misunderstandings later on in the transaction process. 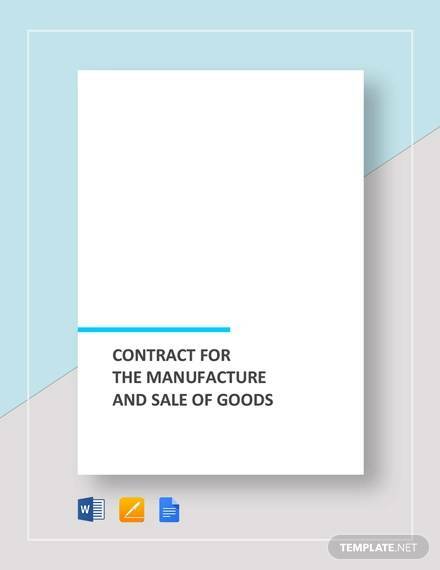 If you need a contract for the sale of goods that you can use for your business, you can download the contract samples available below to help you create a well-formatted and a highly usable document. Putting sample agreement into writing is an important step when negotiating and doing business with a buyer. 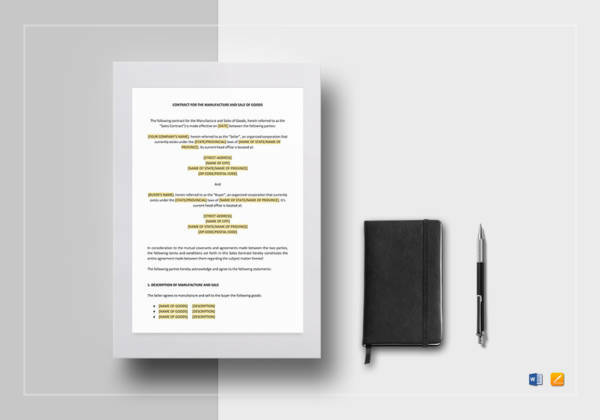 To ensure that the contract that you will be creating is legal, as well as enforceable, it is necessary that you know the various elements and the steps that you need to do to create the document. Here, we have listed the steps on how to create your own contract for the sale of goods. Write a title in the document that you will create. 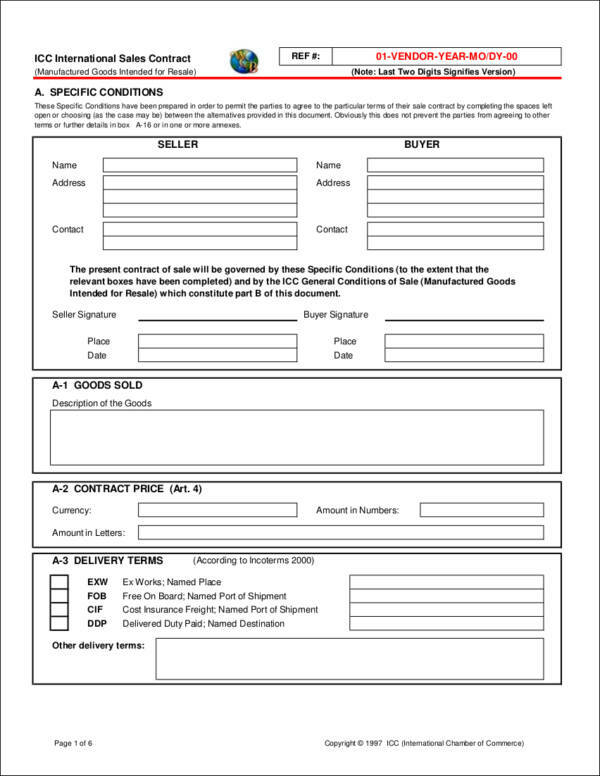 Since you are creating a contract for the sale of goods, write “Contract for the Sale of Goods” at the topmost part of your document. This will help both parties understand the type of contract being created. Indicate the names of both parties, which is the seller and the buyer. Your contract should clearly specify which party is the seller and which one is the buyer. List all the goods being purchased by the buyer, including their prices and the quantity. Lay out the terms as well as the conditions of the contract. This is important in order to protect not only the seller but also the buyer. Specify the payment dates, the payment methods that the buyer can use to pay the seller, and other important information regarding the transaction. Leave a space at the bottom of the contract where the signatures of both the seller and the buyer will be placed. 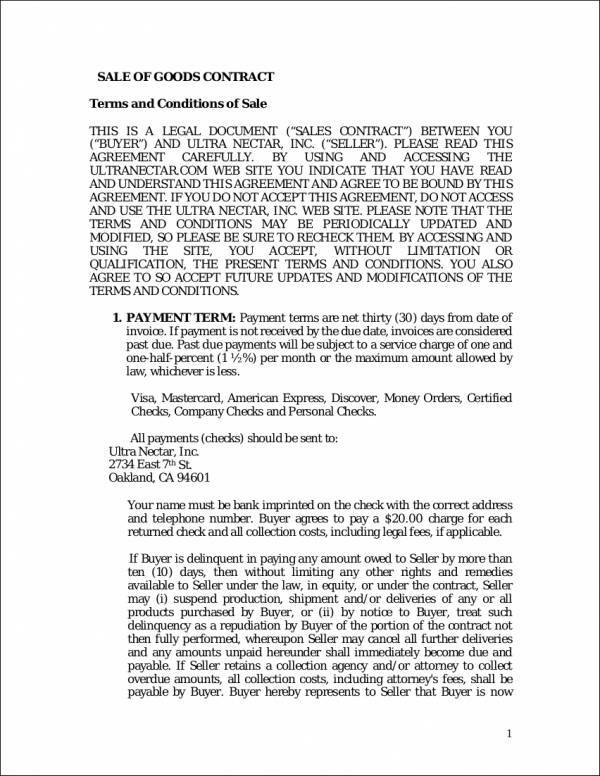 The signature of both parties is important since it serves as a proof that the buyer and the seller have agreed to all the information indicated in the document. You can also see business contract samples. We have listed below a few tips and pointers to help you create an effective contract for your business. Always remember to clearly lay out all the information and details about the agreement. If your contract lacks certain details, it may become hard for you to enforce especially if a disagreement happens during the transaction. 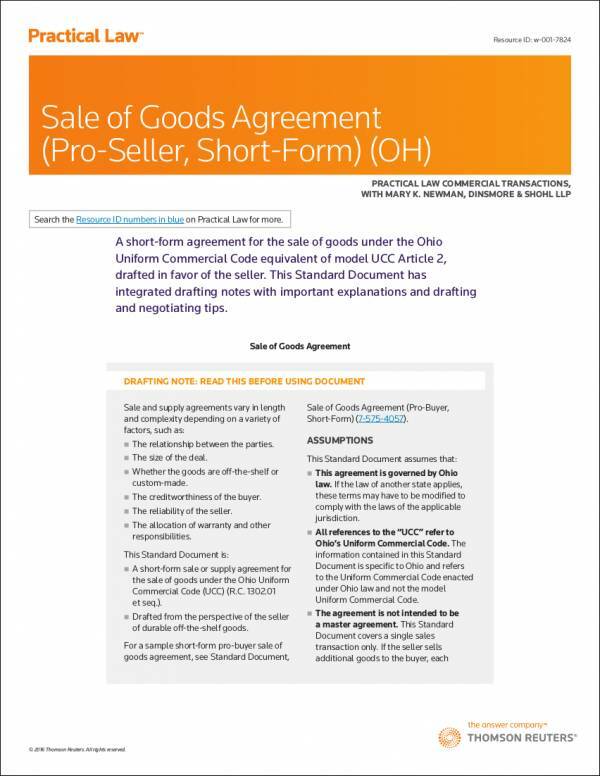 Keep the contents of your sales contract of goods clear and simple. When writing your contract, it is important for you to be on point and veer away from any unnecessary information that will only lengthen your document. Remember to review all the information that you have written in your contract to ensure that any mistakes, misspellings, and typographical errors are corrected. You can also see vendor contract samples. Any information agreed upon by both parties and stated in the sample contract should be kept confidential. Since a contract can contain confidential information from both the buyer and the seller, it is important to have a clause that prevents both parties from sharing this information. Ensure that you follow the tips and the steps that we have provided above when developing your own contract for the sales of goods. Additionally, you can download the samples available here so you can have a well-formatted and legally enforceable document. Should you need other types of contract samples, we have training contracts, cleaning contracts, and business contracts available on our website.